Everyone is a baker around the holidays and we Ohioans are no exception. I would argue, however, that perhaps we do it just a little bit better than everybody else. 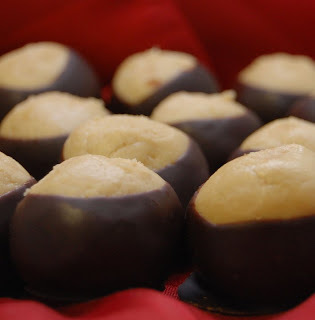 Here in the great state of OH-IO, in addition to all the other confectionery goodies being made during the holidays, it's TRADITION to make buckeyes. It's a tribute to our great state, and for those of us lucky enough to be alumni, to our dearly beloved Alma mater THE OHIO STATE UNIVERSITY. And to be quite honest it's actually a bit more than tradition....more of like an unwritten law. If you are from Ohio, you MUST have buckeyes at Christmas. Otherwise, its not Christmas. So today I'm going to share with you my family's recipe for buckeyes. Probably every family in Ohio has their own, all slight variations of simple ingredients. These include: butter, peanut butter, and powdered sugar. Hey, I never said they were healthy. I only said they were tradition! Using a stand mixer (or hand held), cream together the butter and peanut butter on medium speed (this is where it helps to have the butter really soft, I like to set mine out over night). Continue to mix until they are thoroughly combined. Next, start adding in the powdered sugar slowly, allowing each addition to be incorporated before adding another. You'll notice the mixture will start to come together. Here is the hardest part: achieving the right consistency. You want it thick enough to be able to roll into balls without having it stick all over your hands. However, you don't want it too dry that it won't come together. As you add powdered sugar, the mixture becomes less sticky and more dough like. This is the reason for the range given for powdered sugar. I find sometimes it varies as to how much powdered sugar I need. I think it has to do with the ambient temperature and air moisture on any given day. So just use your judgement. Add the powdered sugar in small batches until you reach the desired consistency. It may take a few times to get it right. Its okay to leave the mixture a little sticky at first. Once you have your mixture, its best to chill it in the refrigerator for about an hour or two or even over night. This makes it much easier to form into balls. After chilling, pull your mixture out of the fridge and begin rolling it into about 1 inch size balls. Place the balls in a plastic container as you finish them. Once you have all the balls rolled, you'll want to chill them yet again before dipping. Once the balls have chilled for at least one hour, they are ready to dip. Make sure you have the chocolate melted and ready to go before removing the balls from the refrigerator (or if you don't have room, you can chill them in a cold garage). They are easier to dip if they are chilled and firm. Then, carefully pick up each ball by the toothpick and dip into the melted chocolate, swirling it a little to give an even coating. Be sure to leave some peanut butter exposed at the top. Then place the buckeye onto a parchment lined baking sheet to set. I recommend dipping the balls in small batches, rather than trying to do them all together. Once the balls warm up and soften, they become hard to dip. Once your balls are dipped, its a good idea to keep them in a chilled place like the refrigerator or in a cold garage to keep them from getting "sweaty," or slightly melted. Some people like to put paraffin wax in their melted chocolate to help stiffen them up. I do not like to do this. I prefer to chill mine instead. These are great to serve at a holiday party. You can even freeze them and eat them slowly over the holidays. They can be a little cumbersome to make but they are totally worth it!